It defeats keyloggers by encrypting your keystrokes at the keyboard driver level, deep within the operating system. when you type it gets encrypted and it reaches your browser, KeyScrambler then decrypts them so you see exactly the keys you’ve typed. Keyloggers can only record the encrypted keys, which are completely indecipherable. 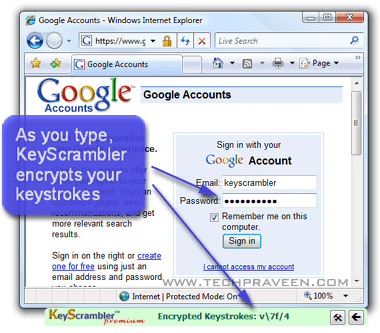 KeyScrambler will protect you from both known and unknown keyloggers. User friendly – Lets you to see realtime encryption. Deep encryption in the kernel adds a unique layer of defense to your current PC security programs. No need for constant signature updates. No more worries about existing or future keylogging attacks. This is seriously one of the most useful security softwares I’ve ever used on my laptop. Its since almost a year that I m using this and its encryption has never let me down. 5 stars.